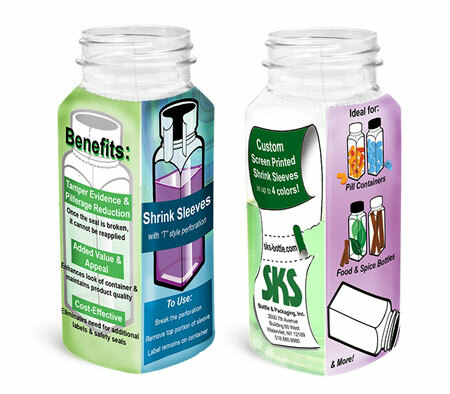 SKS Bottle offers custom printed shrink sleeves for your containers. Printed shrink sleeves are a modern and innovative way to customize your packaging while also adding tamper evident protection to your product. With the wide range of printing types and effects available, we can meet your custom shrink sleeve needs, regardless of the size or shape of your container. PVC (Polyvinyl chloride): Excellent chemical and UV resistance. Transparent, smooth and flexible. Can withstand heat up to 70 ° C.
PETG (Polyethylene Terepthalate Glycol): Excellent transparency, glossiness and chemical resistance. Complies with FDA standards, suitable for food contact. OPS (Oriented Polystyrene): High transparency and glossiness; flexible. Very economical for use as food packaging. Can withstand heat up to 80 ° C.
PLA (Polylactic Acid): A plant based biodegradable alternative to petroleum based shrink films. Derived from renewable resources, such as corn starch or sugarcane. Flexographic: Utilizes a flexible relief plate and can be used for printing on almost any surface including plastic films. Well suited for printing large areas of solid color. Rotogravure: A type of intaglio printing process, involving engraving an image onto a copper cylinder. Uses a rotary printing press. Commonly used in the flexible packaging sector: a wide range of plastic materials can be printed in the rotogravure press. High-luster metallic effects, including silver and gold colors that won�t change luster or gray after shrinking. Can be achieved without use of metal, producing a non conductive package that can be used in microwave applications and won't trigger filling line metal detectors. Tear tapes in a range of colors... and much more!